Seaweed, the oldest plant on earth protects you from modern dangers. The radiation plume that drifted around the world from the Japanese quake disaster was not considered a serious health risk by authorities. This is good news, but many people still wanted extra protection. The oldest plant on earth protects us from many modern dangers, including radiation poisoning, heart disease, inflammation, and cancer. Why not use this situation to add a powerfood to your diet that not only helps prevent radiation poisoning but many other serious health problems as well. When the body is saturated with natural iodine from seaweed, it will more readily excrete radioactive iodine taken in from the air, water or food. This will prevent radiation poisoning of the thyroid. contains 14 times more calcium by weight than milk. high in protein, low in fat and contains little or no carbs. has components which lower blood pressure, prevent arteriosclerosis and combat tumors. Seaweed tastes great when prepared well. Although not so common in our modern western diet, it is enjoyed daily in countries like Japan and Ireland. See recipes with seaweed in them below. Even land lubbers life Randy get used to its unique flavour. Listen to his opinion of seaweed. For maximum nutritional value, eat seaweed fresh. 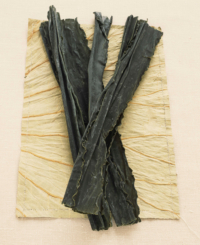 Kombu is a sea vegetable which grows in deep sea waters around Hokkaido. It is sold dry in hard sheets or in powder form. It is mostly used in Soups as a stock. Wakame is a sea vegetable, which grows in cool to cold sea waters. It can be used in soups, salads, with other dishes and as seasoning. Dulse is a red color and has a delicious fresh crisp flavor. It comes in soft sheets in a package or dulse dried granules that can be sprinkled on food either during cooking or at the table. Nori is thin and its oily iridescence reflects the colors of the rainbow. 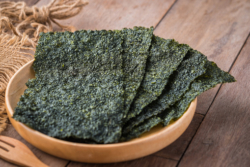 This is the most popular Seaweed for eating, both historically and today. We mostly know it from eating Maki Sushi. It comes in sheets in a package or nori dried flakes that can be sprinkled on food either during cooking or at the table. Arame is a dark brown sea vegetable when fresh and blackish when dried. As all other dried seaweed, it is very rich in minerals, particularly calcium and protein (7.5%). Arame seaweed can be used as a substitute for wakame or hijiki in many applications. Also, there is Kelp which is the most nutritious; it is very high in iodine, contains iron, sodium, phosphorus, calcium, magnesium and potassium and vitamins A, B1, B2, C, D and E, plus amino acids. It is a very strong tasting seaweed which can be over powering for most foods, so I do not often cook with. Kelp is often taken in capsules or powder as a supplement. Has Important Antibacterial and Antiviral Effects. Reduces Cholesterol Levels in the Blood, High Blood Pressure and Arteriosclerosis. Laboratory experiments in Japan have shown that it is due to improved metabolism which reduces the accumulation of fats. Helps Discharge Other Radioactive Elements. Studies starting in 1964 at McGill University in Canada show that a substance in kelp and other common seaweeds could reduce the amount of radioactive strontium absorbed through the intestine by 50 to 80 percent. Macrobiotic Doctors & Patients in Nagasaki, Survived the Atomic Bombing on Aug 9/45 They protected themselves against lethal doses of radiation on a diet of brown rice, miso soup, seaweed and sea salt. It contains B12 (rarely found in vegetables). Now we know why many of us love seaweed so much! It is soooo good for us. Tasty Recipe with Wakame: White Bean and Asparagus Stew: Get your vegan protein with all the health benefits of asparagus here in one shot. Get some Kombu into your diet: Soba Soup: a Japanese favorite. A delicious noodle soup that is gluten free and grain free. 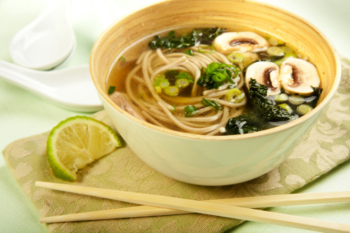 Recipe with Kombu and Wakame: Miso Soup with Spinach and Mushrooms: Another eastern favorite. Question: When was the last time YOU ate seaweed? Answer below. Editor’s note: Technically, algae are not classified in the plant kingdom, and seaweeds are classified in the algae family but whether you use the term plants, vegetables, or weeds, everyone gets the idea; these FOODS are good for you in a number of ways! Yesterday! My stepson get this wonderful seaweed from way off the coast of BC. It is delicious, and even though it is salty and savoury, it feels like you're eating candy! I mean my son-in-law! And hile I do cook with seaweed, the one I'm talking about is dry and light and crunchy. i LOVE seaweed — eat it every day now and have for weeks since i got the diagnosis abouth my hypothyroidism. why i ever stopped eating it years ago, i don't know, but this time around it will continue to be a staple in my life. thank you diana and randy, for all your wonderful articles. Thank you for this excellent presentation on the wonders of this powerful food. I am thrilled that seaweed is getting more attention (the Japanese's health records really do indicate that their traditional diet – 25% sea vegetables every day – and their lowest levels of disease/best overall health). I am also so sad that t has taken ecological and human disasters to push the conversation forward. The really good news is that, while I love seaweed and eat it in various forms….it wasn't until I was introduced to a tasty liquid form, a whole food source of seaweed…a daily vegetable drink, that I now have a consistent, simple, delicious, comprehensive solution to getting the range of nutrients that seaweed provides. The trace minerals are especially important, and not readily available in land-based vegetable sources. Combining with organic aloe vera, (both aloe and sea plants are sources of B12), and with aloe's remarkable ability to make other foods more bio-available….this source has been the answer to my 40 year nutrition search, and long term support for protection, wellness and longevity. When we feed the body all of the (120 known) daily requirements (many are small, but critical) our bodies are remarkable self-healers. Thanks, Diana, for your post! Sea plants can provide many answers and solutions. Where you can buy Seaweed.? I do not live close to the coast and here in WI it is difficult to get even fresh seafish. Barbara, I live over a 1,000 miles from the sea; I get mine from a local health food store. Look under this post: https://www.realfoodforlife.com/miso-soup-with-spinach where one of the members gives a good suggestion. I order my seaweed online. Limu Plus is delicious as a drink. I also created recipes with Limu Plus. Great for marinating meat. Delicious salad dressing, add some olive oil and herbs. My favorite recipe is French Toast. Instead of milk, I add some Limu Plus. Gives the toast a slight fruity flavor. Not need syrup or honey. If you’d like some of my recipes, 303.322.8340. I’ve never tried seaweed, that I know of. But I’m really interested to find some now, having read this article. One concern – there’s no mention of radiation affecting the seaweed and other resources in the sea. Should this be a concern? I’ve wondered about that myself but I haven’t found any information on that yet. Maybe someone else can comment? i eat seaweed every day since i got diagnosed with thyroid problems in february of this year. I, too, wonder about the radiation effects on powerfoods in the Japanese region. I used to eat fish weekly derived from the Japanese Pacific, and occasionally seaweed, but wonder if radiation exposure decreases or makes dangerous these foods I’d normally use to combat toxins. It seems there’s no current information- but keep me posted! I’m very interested to know. just ate some roasted dried seaweed from market last nite and both my son and I tried it! It tasted like what we smell when we go fishing or swimming in the ocean! yuck! What’s Happening i am new to this, I stumbled upon this I have discovered It positively helpful and it has helped me out loads. I am hoping to contribute & aid different customers like its aided me. Great job. Andrea I think you are talking about Dulse or Nori, they are both light and crunchy and you can eat them without cooking them. I like to get my seaweed from http://www.theseaweedman.com it is a small East Coast company that has been run by the same man, Larch Hanson, for about 40 years. He sustainably harvests the seaweed and you can taste and see the difference from other seaweeds. It’s really good! It’s important to get your seaweed from an East Coast company because the Pacific is too polluted with radiation.